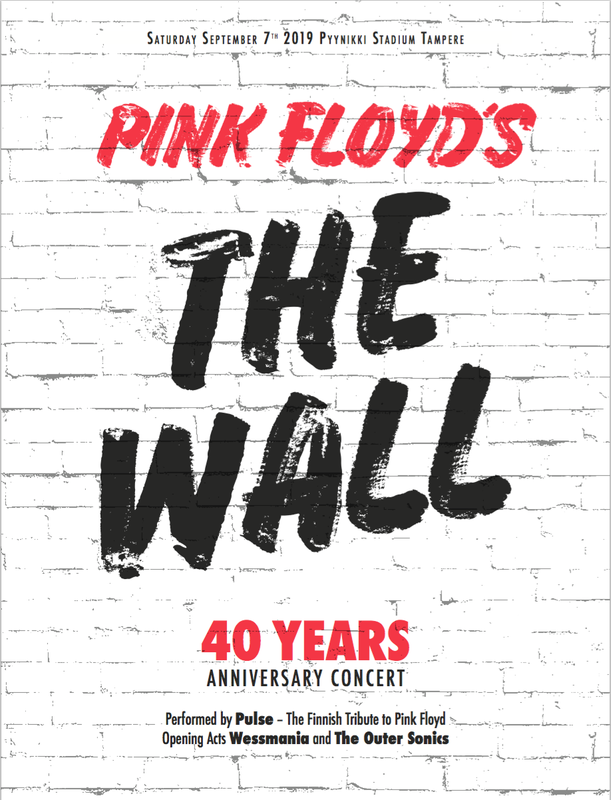 About a year ago we started thinking what could we do to celebrate The Wall's 40th anniversary in 2019. After two successful shows in Finland's biggest concert hall, the Tampere hall, we were thinking how to upgrade from that. This time we wanted to go monumental. Since the beginning in 2005 Pulse has been about going boldly where no other tribute bands have gone. We went through all kinds of ideas, but had one shared vision - the show has to be done in a venue that fits a huge stage, possibility for amazing visuals and thousands of people. It had to be stadium-sized. To celebrate one of rock history's most remarkable pieces of art, we present you The Wall 40 years Anniversary Concert in the heart of Tampere, The Pyynikki stadium on September 7th 2019! The tickets can be purchased from lippu.fi. Spread the word and come in numbers! ...but we were on a break! However, we are going to do one show in year 2018. Dear all, we've been taking some time off from Pulse-things, but decided to do one show in 2018. Join as at Pyynikki summer theatre on August 15th 2018! During the past years we´ve played shows including full albums or following some kind of concept. This time we decided we want to play you the Pink Floyd songs that we, members of Pulse, think are the best Floyd songs ever published. So no full albums, no redoes of Pink Floyd shows but the songs that are most important and most meaningful to us. So come in numbers, spread the word and shine on! For 12 years we, Pulse, have toured around Finland playing a great number of shows in venues big and small. 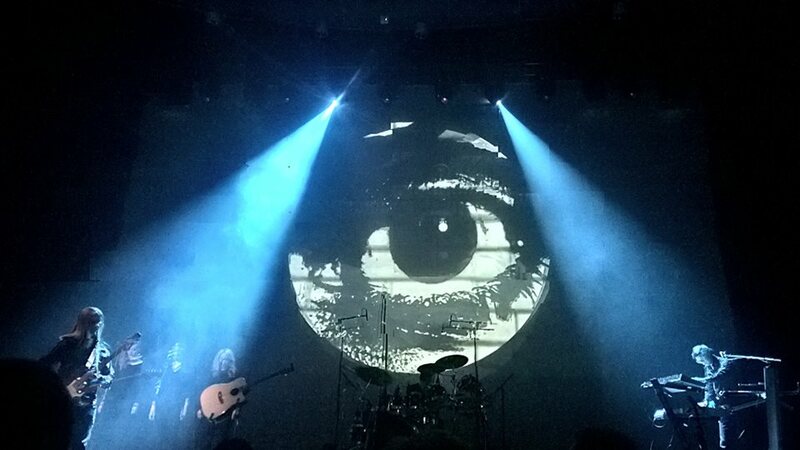 We’ve focused on building a huge sound and spectacular light show as did Pink Floyd in the late 1970’s, 80’s and 90’s. Our next show will be something different from any of the previous ones. Inspired by Pink Floyd’s Live at Pompeii, a show they filmed in an empty amphitheatre in the ruins of ancient city of Pompeii, we will bring you Live at Pyynikki. The show consists mostly of songs from the era before the iconic Dark Side of the Moon album released in 1973. Such masterpieces as Echoes, One of These Days and Set the Controls for the Heart of the Sun and many others will echo in a summery evening while the sun hopefully sets down creating nature’s light show of its own. 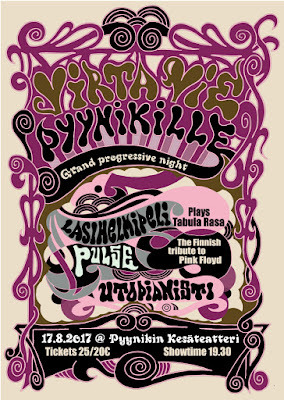 The show is part of Grand Progressive Night, with two other great bands (Utopianisti and Lasihelmipeli). More info from here. Kahdentoista vuoden ajan Pulse on kiertänyt Suomea soittaen ravintoloissa ja konserttisaleissa. Olemme rakentaneet showstamme valtavan valon ja äänen spektaakkelin kunnianosoituksena Pink Floydin 1970-, 80- ja 90-lukujen konserteille. Seuraava showmme tulee kuitenkin olemaan jotain aivan muuta. Palaamme ajassa taaksepäin, 1970-luvun alkuun, jolloin Pink Floyd soitti legendaarisen Live at Pompeii -konserttinsa tyhjän amfiteatatterin raunioissa muinaisessa Pompeijin kaupungissa. Konserttimme ohjelmisto koostuu pääosin 1960-luvun lopun sekä 1970-luvun alun Pink Floydin musiikista – ajalta, jolloin The Dark Side of the Moon -albumia ei oltu vielä julkaistu. Hämärtyvässä elokuisessa illassa kuullaan muun muassa mestariteokset Echoes, One of These Days ja Set the Controls for the Heart of the Sun. Konsertti on osa Grand Progressive Night -tapahtumaa, jossa soittavat myös Utopianisti sekä Lasihelmipeli. Lisätietoja täältä. Thanks to all ca. 1000 ppl who attended our "Sunday brunch" show at Tampere-talo on 9.4. It was our biggest production this far. It felt really good to get such a positive feedback. We will continue our work to bring you musically as well as visually magnificient shows in the future! Photos/videos to follow later on. Thank you and shine on! It´s time to revisit year 1994, when Pink Floyd toured North America and Europe supporting their album Division Bell. Our lead singer Thierry was a young guy living his dream working as part of the bands security team on that tour. 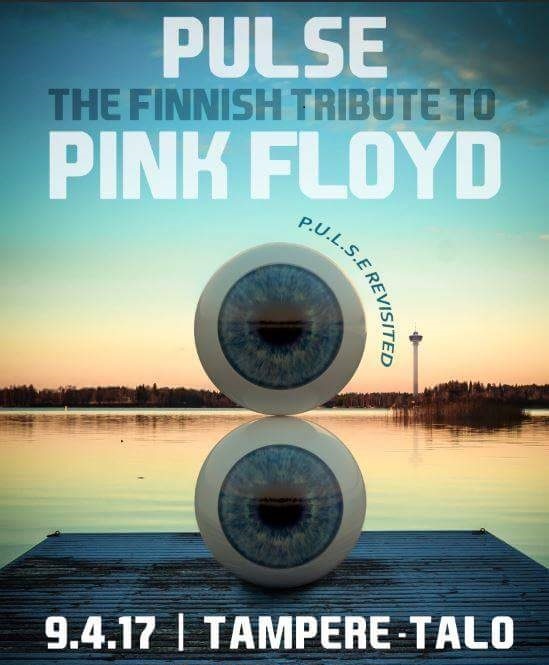 The tour has been a great inspiration to him as well as many other members of Pulse - The Finnish Tribute to Pink Floyd. 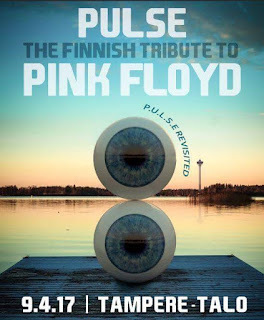 Now we want to pay a tribute to the show captured on Pink Floyd´s P.U.L.S.E (DVD), released in 1995. The same songs in the wonderful setting and surround sound system of Tampere-talo. Join us, when we revisit P.U.L.S.E. "If you don't eat yer meat, you can't have any pudding." We are very proud to announce that we will be playing the third rendition of A Show for Assorted Lunatics in Verkatehdas, Hämeenlinna on Friday 18.11.2016. The core and the synopsis of the show will be similar to what we did in Tampere-talo and Paviljonki (Jyväskylä), but as always, slight variations will occur. Most of the songs will be from the albums The Wall, Dark Side of The Moon, Wish You Were Here and The Division Bell. Tickets can be bought from Ticketmaster. Verkatehdas is one of our favourite concert halls in Finland due to the suberb acoustics and the latest technology they offer for our use. It´s been already almost three years since we played there the DSOTM 40th Anniversary Show. We are very thrilled to play there again! Hello (hello, hello)! A very special thanks to the ca. 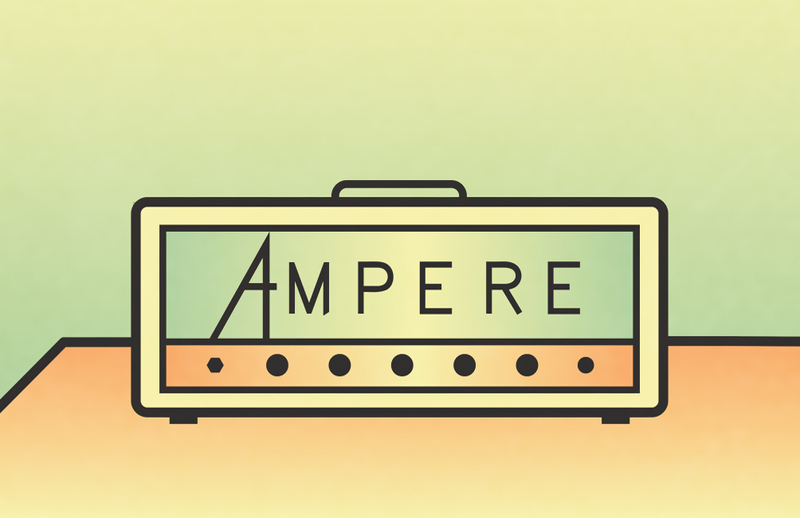 450 people who joined us on our 50th gig ever and the 2nd one in Jyväskylä (the first was in 2008 in a small local bar). 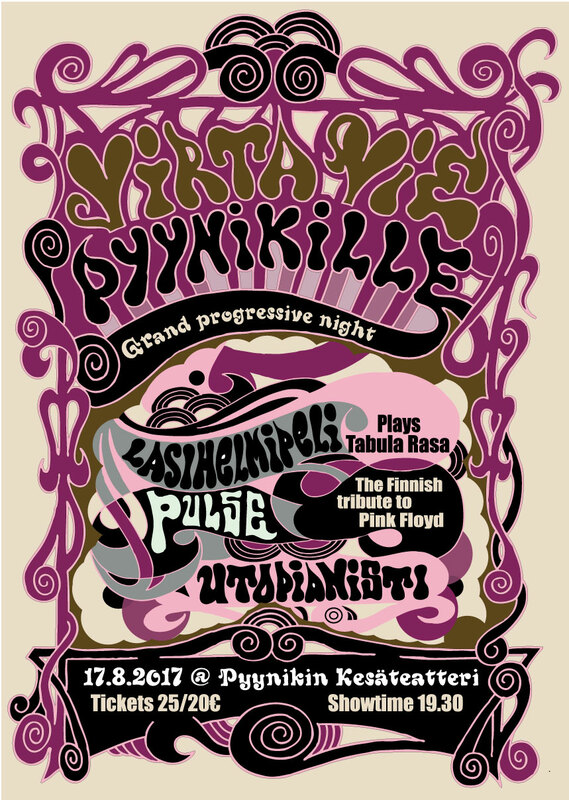 It was nice to see there are fans of the music of Pink Floyd outside Tampere as well... We will be coming back for sure! Bigger and better!